Staggered shell stitches on this Wistful Wisteria hat-and-mitten set impress with an even overall texture. The fold-back hem on the hat and the mitts hides a cleverly concealed bit of elastic for the perfect fit. Notions: Tapestry needle, sewing needle and thread to secure elastic, 1 yd 3/8” wide flat elastic, mother-of-pearl buttons (2 – 1” buttons; 4 – 8” buttons). Shell: (3 dc, ch 1, 3 dc) in same st.
One skein of yarn will make the smaller hat, but you would need a small amount from the second skein for the larger one. There is plenty of yarn for either size hat and the gloves in two full skeins of yarn. Ch 80 (88). Join into a ring with sl st in first ch, being careful not to twist the chain. Rnd 2: Ch 4, 3 dc in same sc, sk 3 dc, sc in next ch-1 sp, *sk 3 dc, shell in next sc, sk 3 dc, sc in next ch-1 sp. Rep from * around, sk 3 dc, 2 dc in first sc, join rnd with sl st in 3rd ch of beg-ch-4. Rnd 3: Sl s1 in first ch-1 sp, ch 1, sc in same ch-1 sp, sk 3 dc, shell in next sc, *sk 3 dc, sc in next ch-1 sp, sk 3 dc, shell in next sc. Rep from * around, sk 3 dc, join rnd with sl st in first sc. Rows 4-10 (12): Rep Rnds 2-3 three (four) times then Row 2 once more. Rnd 1: Sl s1 in first ch-1 sp, ch 1, sc in same ch-1 sp, sk 3 dc, (2 dc, ch 1, 2 dc) in next sc, *sk 3 dc, sc in next ch-1 sp, sk 3 dc, (2 dc, ch 1, 2 dc) in next sc. Rep from * around, sk 3 dc, join rnd with sl st in first sc. Rnd 2: Ch 4, 2 dc in same sc, sk 2 dc, sc in next ch-1 sp, *sk 2 dc, (2 dc, ch 1, 2 dc) in next sc, sk 2 dc, sc in next ch-1 sp. Rep from * around, sk 2 dc, dc in first sc, join rnd with sl st in 3rd ch of beg-ch-4. Rnd 3: Sl s1 in first ch-1 sp, ch 1, sc in same ch-1 sp, sk 2 dc, (dc, ch 1, dc) in next sc, *sk 2 dc, sc in next ch-1 sp, sk 2 dc, (dc, ch 1, dc) in next sc. Rep from * around, sk 2 dc, join rnd with sl st in first sc. Rnd 4: Ch 4, dc in same sc, sk 1 dc, sc in next ch-1 sp, *sk 1 dc, (dc, ch 1, dc) in next sc, sk 1 dc, sc in next ch-1 sp. Rep from * around, sk 1 dc, dc in first sc, join rnd with sl st in 3rd ch of beg-ch-4. Join yarn with dc in opposite side of foundation ch, directly opposite first sc in in Rnd 1 of Hat. Rnds 3-4: Rep Rnd 2 of Hat, then Rnd 2 of Hat. End off after Rnd 4. Loosely ch 32. Join into a ring with sl st in first ch, being careful not to twist the chain. Rnds 2-3: Rep Rnd 2-3 of Hat. End off after Rnd 3. Rep instructions for Brim of Hat. There will be 16 dc in the mesh rnd, and 4 shells in the edging. 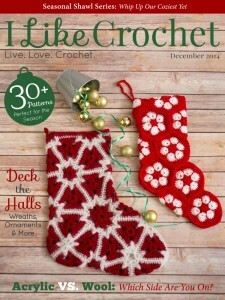 Block lightly – do not overblock as the elasticity of the stitch pattern and the yarn make the accessories fit better. Cut elastic for Brim/Hems the length that will comfortably around your head/wrists, plus .5” for overlap. Weave each elastic in and out of the dc/mesh row of the Brim/Hems. Overlap .5” and the the ends together with the sewing needle and thread. Fold up Brim/Hems at the base of the dc/mesh row. Tack into place all the way around, or simply use the decorative buttons to keep the hem in place on one side. 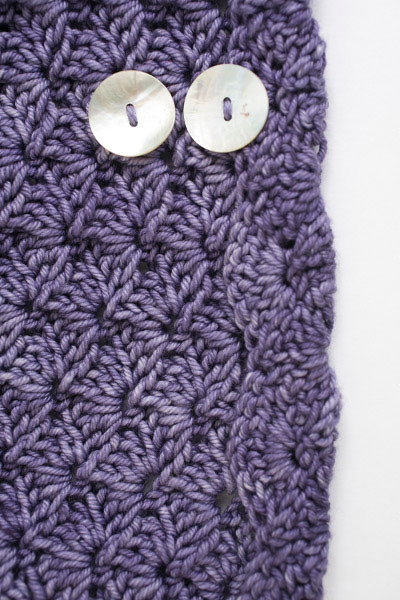 Stitch buttons into place as shown in photo – the large buttons on the hat, and the small buttons on the fingerless gloves. This is a pretty set , can’t wait to make it.